I feel compelled to make a disclaimer: I don’t think anyone is normal, or that there truly is a “normal” type of person. As my friend Alan used to sing, “it’s not that we’re all weird, it’s just there’s no such thing as par.” There are many experiences and traits we all share as humans that are universal, but we are all pretty quirky in our own ways. So I guess it’s normal not to be normal? And I am definitely not. One of my abnormalities is in the way I eat, and since it is a universal human experience to eat food regularly, I often feel my un-normal-ness in this area of life. Because of health issues I do not eat eggs, wheat/gluten, corn, soy, traditionally raised red meat, and more. I really try to avoid sugars and processed oils. Processed anything, really. I have a couple of posts brewing about my health journey and will be sharing eventually. Anyway, sometimes I feel left out, although I know it’s not anyone’s intention to make me feel that way. It can be difficult to eat only carrot sticks at a party while everyone else eats pizza and cake. I also feel misunderstood, because I don’t have the time– or desire– to explain my health needs to people I encounter in social eating situations. I worry that people think I’m on a diet and not willing to let loose just once at a fun occasion, or that I’m a health-food snob and am silently judging their own choices, or that I’m just following the latest food fads. Some of that judgment is perceived, but some of it is real. I also feel like I’m a burden to people who try to accommodate my needs, because my diet doesn’t fall neatly into any one category: if a food is labeled gluten-free or vegan it still often contains corn, soy, or sugar. It is very rare that I can enjoy any packaged foods without having to make some compromises. And the packaged foods I can enjoy are usually not found at local stores. I feel terrible when someone has picked something up just for me but it turns out I can’t eat it. Woe is me, right? I promise I’m not whining! My intention is only to explain my experience, and to let others in the same boat know they are not alone. I love the “me too” feeling I get from reading about others’ similar experiences and hope to give that feeling back to my (small group of) readers. I don’t spend much time feeling bad about my “weird” diet because it is responsible for slowly and surely turning my health around. It’s hard to feel bad when I actually feel pretty good for the first time in many years! So if this is weird, I don’t want to be normal. But on to my point: because most of my time is spent feeling different about food, it’s nice to get close to the ever-elusive “normal.” That’s where sweets come in. Several years ago I started to really hit my baking stride. I enjoyed whipping up brownies, cakes, bars, and even cookies (one thing I had always managed to burn). I started to try yeast bread and discovered it wasn’t as mystifying as I thought it would be. And now that I’ve made big changes, I sometimes miss my old friends! Coffee cake, banana bars, wheat bread, FROSTING….. sigh. There are so many recipes that try to re-capture our favorite unhealthy classics using healthy ingredients, but they usually miss the mark. Trust me: I’ve tried and failed with three different donut recipes this year. Sad face. I have learned not to expect much when I try a healthed-up version of an old classic. I will never again use avocado with chocolate. Forgive me, Lord, for ever thinking it would work; and please forgive everyone on Pinterest who perpetuates the myth. But. BUT. This week I tried a new recipe and hit the jackpot! I am eternally grateful (not an understatement) to Gluten-free Gigi for her darn-near-heavenly pull-apart bread. This bread is surprisingly moist and light despite the absence of wheat, eggs, and dairy. My adaptations: I used coconut oil as my fat and almond milk in place of dairy. I didn’t have any yogurt, so I doubled the buttermilk and added a tiny “flax egg” of 1 tsp. flax + a tablespoon or so of water to get that gelatinous texture the yogurt brings. Next time I’ll probably skip the flax to see if it made a difference. I added vanilla extract to both the dough and the drizzle. I found ways to cut the sugar significantly by using stevia in the dough. I did cave and add coconut sugar to the cinnamon coating, but that was less than 1/4 cup and I felt okay about it. I used honey and a bit of stevia in the drizzle because I was out of maple syrup. I thought it tasted great but Mike thought it might “need work.” Should I have told him that he needs work? 😉 I didn’t, but I thought the honey drizzle was good. Maybe it was the stevia my husband didn’t care for, so next time I’ll leave it out of the drizzle. At any rate, I loved this recipe. It instantly endeared itself to my heart, and will be a new go-to dessert that I can share with “normal” people. I also plan to make it a go-to recipe for a special “normal” breakfast. A Saturday morning with monkey bread, hash browns (with homemade ketchup! ), and a big cup of coffee sounds like the perfect way to forget my (admittedly small) troubles for a while. Free from: gluten, dairy/casein, soy, peanuts, tree nuts, corn, eggs and yeast. Preheat oven to 350F. 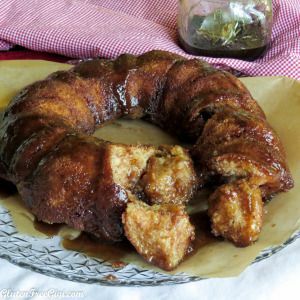 Grease a Bundt pan (or other tube pan). In a small bowl, combine sugar and cinnamon coating ingredients; whisk to blend; set aside. Combine milk and vinegar in a small measuring cup or bowl; stir; set aside. In a large mixing bowl, combine flour, sugar, baking powder and salt; whisk to blend. Cut cold fat into cubes (if using stick butter or dairy-free baking sticks) OR scoop teaspoonfuls from the measured ½ cup of dairy-free spread (if your product comes in a tub). Add these small fat portions to the dry ingredients. Cut in with fork, pastry blender or your hands. Add milk/vinegar mixture; stir with spoon until dough is uniform. It will be sticky. Set up your work area by having the bowl with dough, a Tablespoon (measuring spoon) or small ice cream scoop, the coating mixture and your greased baking pan lined up. (This will keep the process moving along and keep the mess to a minimum.) I like to work near the sink for this so I’m able to keep the water at a trickle to run my hands under periodically. Moist hands mean no dough sticks while we work. With moistened hands, scoop dough in Tablespoon portions, roll gently into ball shape (not perfect rounds, just until smooth and formed), give each dough ball a good coating with the cinnamon sugar mixture, then place each in the prepared pan. You will make a complete circle in the bottom of the pan, then begin again with an inner, then an outer circle of coated balls of dough. No need to press the dough together. You will have leftover cinnamon/sugar coating mixture. Evenly sprinkle it over the top of the dough in the baking pan. Place the pan in your preheated oven and bake 25 minutes. While the bread bakes, whip up the drizzle by combining ingredients in a small saucepan over medium heat. Stir until mixture bubbles, then cook about 5 minutes. Removed from heat; set aside. When bread is baked, remove from oven, pour about ⅓ of the drizzle over the top and allow it to cool in the pan 10 minutes. After 10 minutes, invert it onto a serving plate. Pour remaining drizzle right on top and you’re ready to serve! I had a dream last night that I totally binged on cake and frosting. It tasted wonderful, but I felt so guilty. Hope you didn’t wake up sick… that would be crazy. I’m so glad you found a go-to feel-good sweet treat! Great to eat AND to make, I’m sure. Thanks, Annette! Yes, it is good to make it and eat it. I don’t realize how much effort my diet takes until I find something that is easy. Even when it’s hard, though, it is a blessing to access the food I need and have the energy to prepare it.